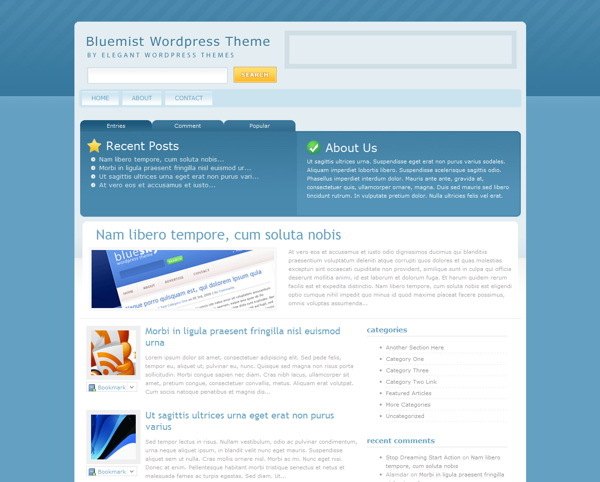 BlueMist is a great wordpress theme for those looking for a smooth and elegant design for their blog. This template takes advantage of custom fields to allow for integrated thumbnail images, as well as various plugins to help take your site to the next level. This theme comes advertisement ready, featuring an unobtrusive integration of Google Adsense. Refer to the list below for the full range of features. Designing and organizing your posts has never been easier, with the help of a large collection of shortcodes you can create beautiful and complex layouts with ease, greatly improving the functionality and variety of your content. This theme has been localized for easy translation. Using the theme’s MO and PO files, you can quickly translate the design without having to hunt through the theme’s PHP files to change each word.